This entry was posted in Just Life on December 24, 2016 by Steve Tilford. The drive yesterday wasn’t as bad as it could have been. It was always a little about 32 degrees, so the roads were just wet, not frozen. It is amazing how many people are driving on the Friday before Christmas. I drove about 3 hours out of 9ish. I wasn’t as bad as I had anticipated. I say that, but get this mental fatigue after about 1 hour and a half. I guess that is normal now. At least according to my doctor. It is slick here in Chicago. It has snowed some and it never really melted, even though it was close to 35 degrees when we showed up last night. I have no intention of falling and whacking my head, so I’m taking it pretty slow. I feel like an old guy, but the risk/reward mix doesn’t pay off here. Plus, I’m officially sick. Mike Crum posted a comment yesterday chastising me about going somewhere sick. The end was – steve, if you’re sick, why are you going out to a healthy persons house and spread your germs????????. you’re bitching about a 10 hour drive, stay home…….stay home and get well..you said you got your germ from somebody, so now you are going to give your germ to some healthy person.. not cool…. Mike, I really didn’t consider that I could just skip Christmas and lay in bed. It never crossed my mind. If I was planning to go to a Christmas party and was sick, then yes, I probably would skip it. But Christmas 600 miles away seems obligatory. Plus, I wasn’t “bitching” about a 10 hour drive. I was worried that I was going to not be able to handle the movement that long. I was having a hard enough time going back and forth the hour to Kansas CIty for my doctor’s appointments, I thought the 10 hours would be too much. It was fine, but thanks for asking. I still haven’t really shopped. I usually do it today. I say that, but it is going to be a chore. It is a bit of chaos always here. As it is probably most everywhere. I do enjoy people watching today, but maybe not so much so feeling like this. I’m drinking DayQuil. I’m not sure how good that is for my brain, but my head is so congested, it has brought back many of the same symptoms as a TBI, although to a much, much lesser degree. Funny how that is. Trudi’s mom lives in Mt. 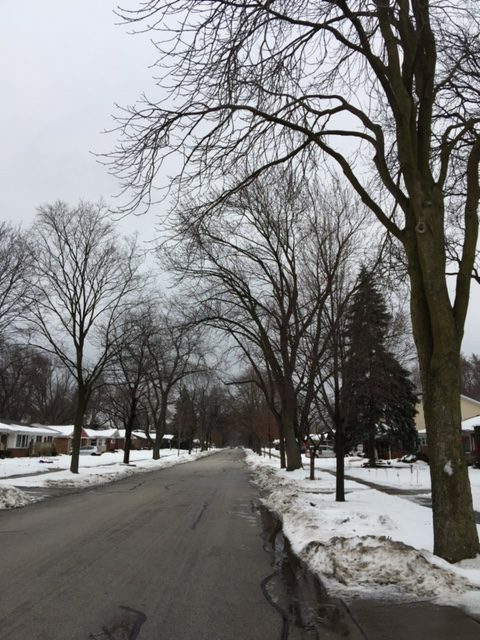 Prospect, a Northwest suburb of Chicago. It is very organized. The village actually plants trees along the streets in each yard. All yards get a choice of trees and 2 maximum. It really makes it looks super in the spring, summer and fall. Actually, it doesn’t look too bad even in the winter. I love tree covered roads. Okay, that is about it. My brain is telling me to stop. Hope you have a good Christmas Eve. 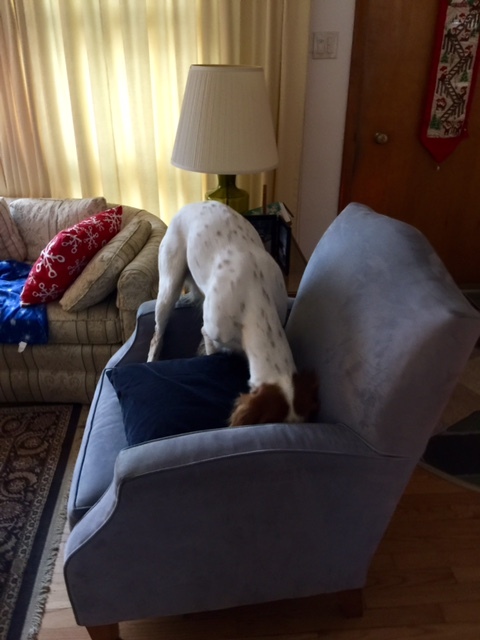 Tucker hiding his toy at Trudi’s mom’s. The sidewalks are a little slick in some places. 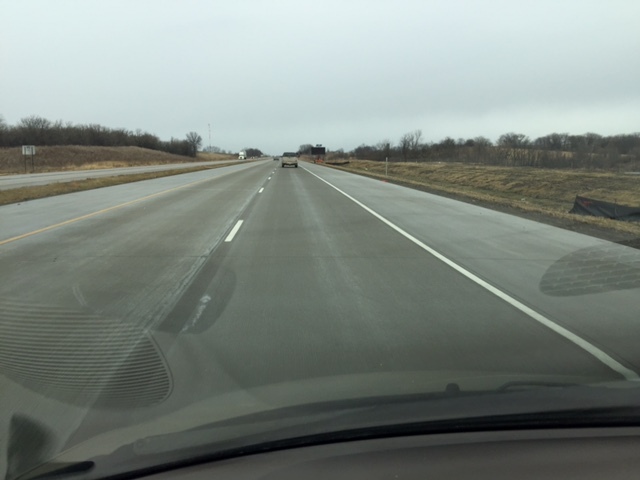 The rebuilt the interstate in Iowa. Straight concrete. Pretty nice. 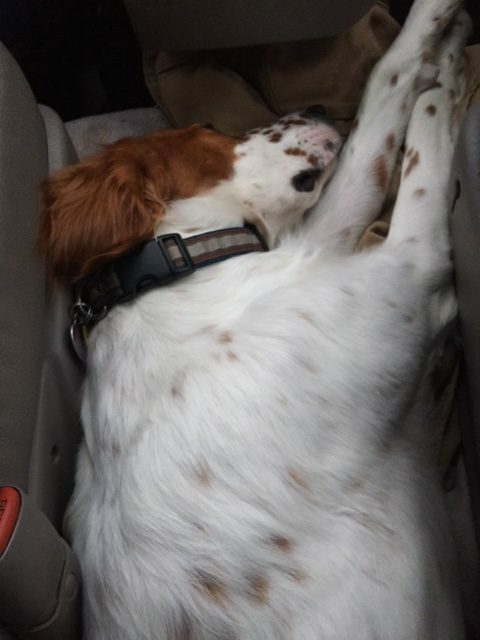 Tucker slept most of the trip between the front seats. If you have a little extra time, the cross race yesterday, in Diegem, is below. Unless Van Aert learns how to ride through sand faster and bunny hop barriers quicker, Van der Poel is always going to beat him at the end. 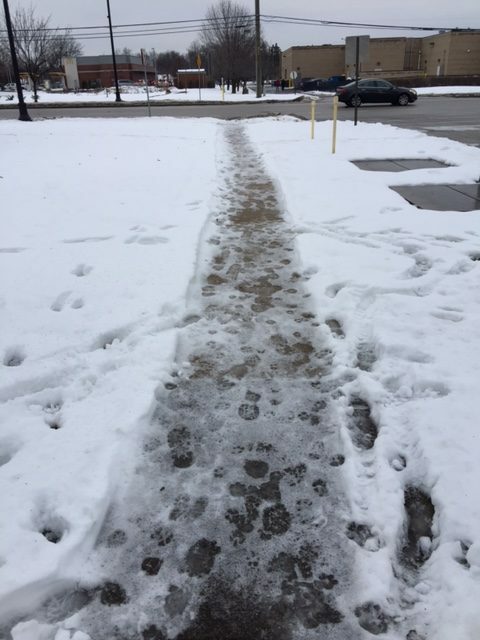 No one ever shovels their sidewalks in Illinois so be careful. Peace, Love, Joy, Health, Happiness; God Bless you mightily. Crum is spending Christmas alone because no one wants to be infected by his crap attitude about everything. Just the fact that you’re getting better and can be there with family on Christmas is a blessing, considering the seriousness of your injury. Pretty sure everyone in the pedalocracy (including the people who read your blog :o) is wishing you a great Christmas and ever-improving health in the New Year. Merry Christmas Steve Tilford ! Merry Christmas wishes to you and Trudi from warm Dallas! Forever Steve’s devil’s advocate… He just can’t help but to pick Steve’s life apart. Well, we’ll still wish Crum a Merry Christmas – maybe he’ll have three dreams tonight and wake up a better man! Wrong, he is hanging out with his buddies in that trucker bar. Yeah, that bunnyhopping on the last lap was pretty insane! Hanging out is the safe for work version. Crum’s seen so many nice sleeper cabs he’s lost count.